Atty. Rodolfo A. Salalima, also known as Rudy, has always displayed excellence in the field of law and telecommunications in the 40 years of his career. He has held various key positions in the telecommunication industry, which were crucial to the development of the country’s ICT environment. 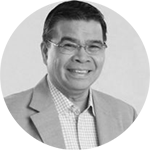 He previously served as a member of the Executive Committee of the National ICT Advisory Council, as the President of the Philippine Chamber of Telecommunications Operators, Inc. (PCTO), and as a Board Director of the Telecoms Infrastructure Corporation of the Philippines (TELICPHIL). Internationally, he was previously the Vice Chairman of the International Telecommunication Union (ITU) Council Working Group for the Amendment of the ITU Constitution and Convention at Geneva, Switzerland. Atty. Salalima served as chief counsel of Innove Communications, Inc. and as chief legal counsel and senior advisor to Globe Telecoms in the private sector. Prior to this, he was the Vice President for Legal and Human Resources Department of the International Communications Corporation (Now BayanTel). From 1992 to 1996, he served as the first President and Founding Director of the Telecommunications and Broadcast Attorneys of the Philippines Inc. and was the immediate past President of the Philippine Electronics and Telecommunications Federation. After retiring from Globe in 2015, the UP Law Center published Atty. Salalima’s book named “Telecommunications in the Information Revolution,” breathing insight into the relation of the law and the telecommunications industry. On June 22, 2016, he was appointed as the Secretary of the Department of Information and Communications Technology by President Rodrigo R. Duterte.